Something of a breakthrough on the Richmond poem last night and this morning. This is it: I will deliver the poem with the ingredient of improvisation, as I do my Fights With Poems pieces or as I will teach my classes at Interplay and at the Writer's Forum. That is, I will memorize my talking points in order and the bright stones of language that must come into the poem and to leave the prepositions and transitions to the moment. They'll take care of themselves. The Richmond poem will flow that way, without paper. I am making it more positive — because I am genuinely grateful to live in Richmond and proud of my town — no matter what they say. I am coming to like it a lot, the poem, as it coalesces around the classic image: Rosie the Riveter's arm as she makes a muscle. Human strength and frailty. Striving. What poem today book 16 in which Daniel does all manner of things poem-related. Nearly nearly finalized letter to Cameron + Co. I am taking my time, making it clear. I have a good feeling about that press. Actually, I have a good feeling every time I submit work I realize. It is a certain faith that I find I can muster again and again. Yes! This is the good one! This is the match! This will find the editor at her or his desk in just the perfect mood to get what I'm saying, see the potential, fall in love with idea, want to see more, want to make it work. I feel it every time I click send. Received payment from Flapperhouse for my two poems "The fallow months" and "What's cooking." Token payment still makes me happy. And I'm glad those two poems, both favorites, found a good home. "The fallow months" I have really worked on over the months! Also took time to add submissions to DuoTrope tracking tool. I am not 100% with it because the range of my submissions is so broad. There are submissions like those for Like/Share art show, performance ideas, and the complete MS, which DuoTrope is less adept at tracking. But in general, it's a great too, and encouraging. So I'm glad I updated it. Posted a review of Alison Luterman's new book "Desire Zoo." Read more of Rattle, a dang good poetry journal! Also drafted a more Rattle-style bio paragraph. Less about writing credentials and the "doing" of being a poet and more about what goes into poeming, living as a poet, the "being." Did more research and note-taking in preparation for my July 17 class at the Writer's Forum in Petaluma, including finding the editing issue of Writer's Digest from last year. Quiet weekend. Some stewing and brewing on Richmond occasional poem. Submitted poems on Monday to Liminality. Very glad to find this fledgling press as it seems a good match for the some of the more ephemeral poems later in One Way to Ask. Nearly finalized letter to Cameron + Co. I feel earnest about querying them and want it to ring from the first touch. How cool would that be - to work with a press in easy driving distance?! Made some revisions to my plum poem. There was a line in it, "on my account let none be judged," which I came to realize emerged from the real-time context of my writing the poem. I was in the hot pool at Kabuki Hot Springs. This was the poem I wrote by composing while committing to memory each of three stanzas. I was annoyed by someone in the warm pool who was IMHO needlessly crowding my personal space. At last (and after already submitting the poem, I think to Poetry Magazine, aiming quite high), I realized the line wasn't serving the poem, so on my walk today through the city, I found a better option for lines 15 and 16. Still not going to publish this poem online though as I think I will find a home for it in a journal and some are sensitive about ANY prior appearance. Wrote a new poem on the occasion of Mirabai's penultimate day of school poetry slam event. Her teacher, Julie Patten asked me to do the first poem. These ideas had been bouncing around for a while, and this morning they manifested. Started work on a new limeronnet, hoping to post to good old Mad Kane's Humor Blog. I've invented the limeronnet, a combination of limerick and sonnet. It's got limerick meter, humor and sass in a 14-line remix. What will happen next? Posted "The limeronnet" at IMUNURI. Began drafting the next submission query for One Way to Ask. This will go to Cameron + Company because they make nice books with art and they are nearby in Petaluma. I like that they are a family business with deep roots in the Bay Area and in art. For this query, I'm going to use prose rather than go again with the cover letter in the queron form. We stopped only to snap the Klondike’s sign. With half the neon dead, DIKE glowed bone white from the marquees into the black outskirts of Vegas. No cars but ours in the lot, but Robert tried the door. It wasn’t locked. one emotionless security guard, and a barkeep watching reality TV, none of whom moved to look at us as we toured, astounded the DIKE could be operative in fact if not in spirit. A wheel of fortune hung on the wall. We each spun for imaginary prizes. Posted "Dike Sunset Casi" on Facebook for some nice feedback and varied likes. Vegas weekend. Saw the sky get light. 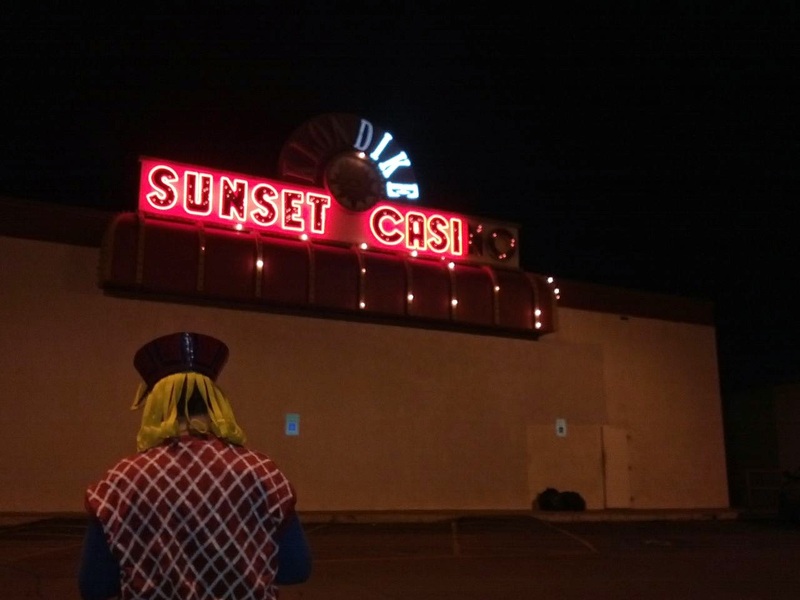 Visited the ghost casino Klondike Sunset twice. Jotted some notes from the most drunken state I experience. Began the first lines of a Vegas poem, a traditional observance for me. This year, a queron. The rest stays in Vegas. Get it? Got it? Done!